Representative Betty Komp currently presides as chair of the Western Oregon University Board of Trustees. 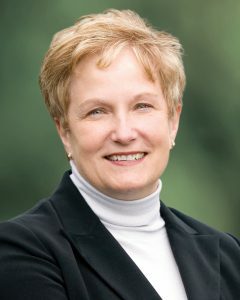 Rep. Komp first became connected with WOU in her mid-30s when she was looking for a life change and decided to attend college. She transferred from Chemeketa Community College to Western and earned a bachelor’s degree in 1990. She began teaching at Woodburn High School and later earned a master’s to become an education administrator. Frustrated by federal education mandates, Komp decided to run for public office 12 years ago and won a seat in Oregon’s House of Representatives. Komp joined WOU’s Board of Trustees in January 2017 after retiring from her position in public office.